MSC Apex 101 for Aerospace Applications - Model Connection Strategies | Evotech Computer-Aided Engineering Ltd.
Design of aerospace vehicles has always been a challenging task due to the complexity of the structures and level of physics that needs to be involved. With recent technology advancements, engineers have been able to utilize CAE methods and reduce much of the product development cost. However, when dealing with complex aerospace structures that consist of multiple parts and assemblies it is not easy to reach the desired design and development goals in a timely manner. The latest release of MSC Apex, Harris Hawk, delivers efficient and dedicated solutions that allow users to rapidly build model connections and manage assemblies. This webinar demonstrates the full process description that can be used for real working aerospace structures (i.e. a full wing). Topics presented can help you create interactions between parts with dissimilar meshes. 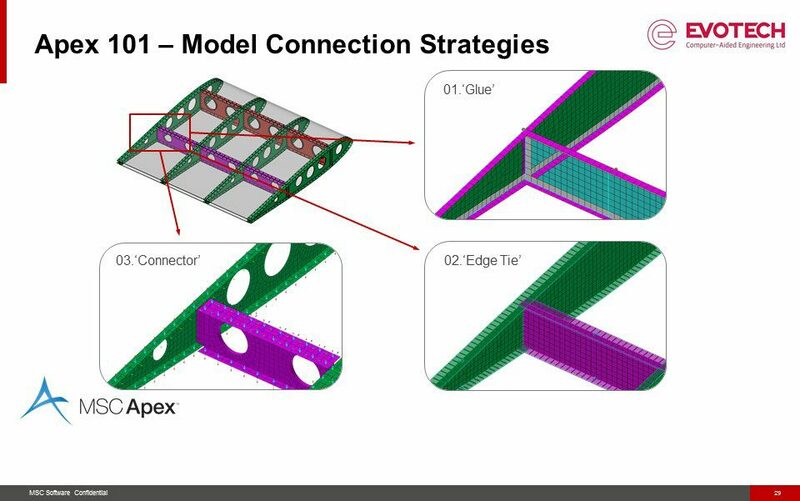 From meshless techniques for gluing multiple parts to creating detailed fastener connectors, MSC Apex can be used to automate model preparation tasks, resulting in a significant reduction in model creation time.